Since the establishment of our parish, Sunday school has been an integral part of our church activity. Classes begin at 9:00 AM with a small prayer and finish at 9:45 a.m. just in time for the children to attend the morning prayers and the Holy Qurbono. We have about 32 Children in classes ranging from Pre-K to 12th grade. Currently there are 10 full time teachers and a few substitutes. We follow the Oriental Orthodox Church curriculum approved by the Sunday School Association of the American Diocese of Malankara Orthodox Syrian Church. Our Sunday school calendar year begins in September and ends with final examinations in June. The Sunday school children actively participate in all church functions to display a kaleidoscopic variety of their talents and abilities. The fact that our children win prizes every year in the regional as well as diocesan level competitions is a matter of great pride for us. 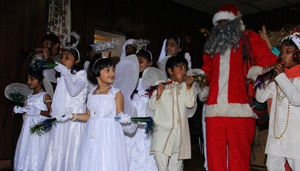 All the children take an active role in Christmas carol service, Church picnic, bake sales, cloth and can food drives and other charitable activities.